Starting with an Ertl promo of a 1991 Geo Storm, I disassembled it and turned it into this pro street car. It's just a simple slam model with parts box wheels and a hood scoop. I also added alum. tube exhaust tips. 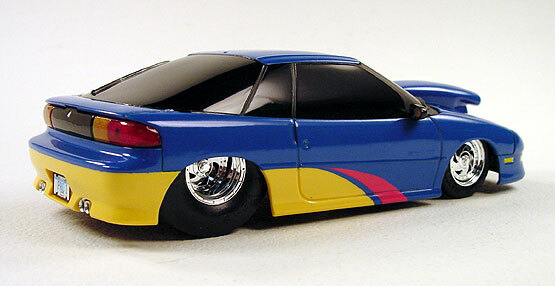 In the '80s and '90s slam models were very popular but, I don't see people building them much anymore. This model was completed around 1993.